The John McCain Russian saga keeps getting more bizarre. Sen. John McCain as a presidential candidate in 2008 directly and illegally propositioned Vitaly Churkin, the Russian ambassador to the United Nations, to donate to the McCain/Sarah Palin GOP ticket, according to documents released by Wikileaks. Since the 2016 presidential election in Nov., Sen. McCain has accused Russia of hacking and meddling in U.S. politics and President Donald Trump’s successful campaign. 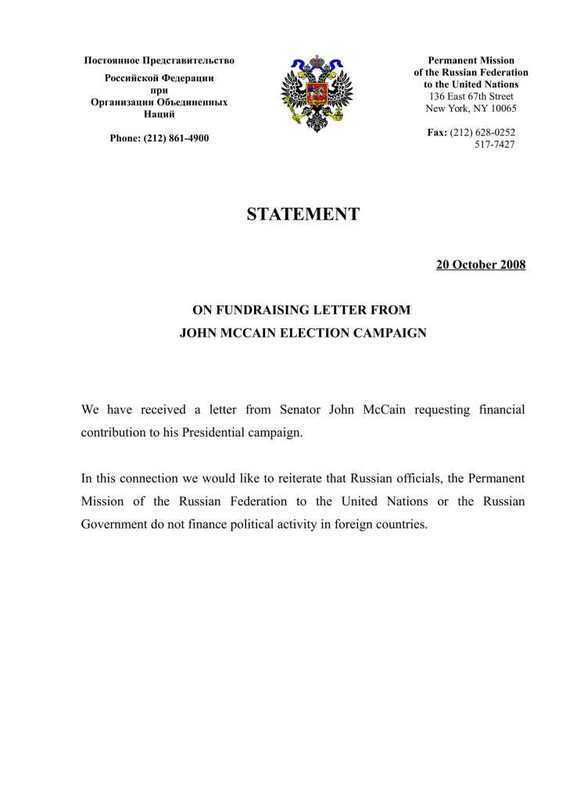 But ironically it was McCain himself who forced Russia to interfere in the 2008 presidential campaign by asking the ambassador and Russian embassy for a campaign contribution. Adding intrigue to an already bizarre story, True Pundit recently contacted Russia’s Permanent Mission (embassy) in New York for comment from Ambassador Churkin regarding McCain’s unorthodox written request for money. By Tuesday, however, diplomatic staff reported Ambassador Churkin had died suddenly at the embassy late Monday. NBC News has framed the death as suspicious. Nonetheless, at the time of McCain’s presidential campaign, however, Churkin and the Russian government fired off a terse letter and official statement to the senior U.S. senator’s request for thousands in cash to his campaign. “We have received a letter from Senator John McCain requesting financial contribution to his Presidential campaign. Russian officials clearly understood that McCain’s request was not legal per U.S. law which forbids foreign governments from contributing money or assistance to presidential campaigns and U.S. presidential candidates from seeking foreign donations. Apparently McCain didn’t know this or simply ignored it before sending his Sept. 29th letter addressed directly and personally to Churkin at the Russian embassy on 67th Street in Manhattan. For Individuals – The first $28,500 will go to the RNC, the next portion will be divided evenly between the Michigan, Missouri, Ohio, and Pennsylvania state parties’ federal accounts up to a maximum of $9,250 for each Committee, and the final $2,300 will go to the Compliance Fund. The Russian response to McCain’s campaign which was leaked to and verified by Wikileaks is below and at Wikileaks.